Reports on Astronomy: Transactions of the International Astronomical Union, Volume XIXA. 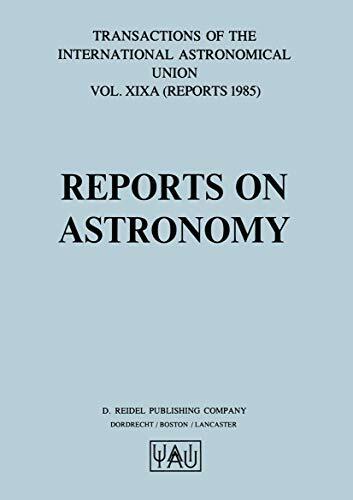 volume XIX A of IAU Transactions contains the reports by Presidents of Commissions, covering the period July 1981 - June 1984. The topics of IAU Commissions deal with all of contemporary astronomy and the present volume therefore constitutes an exhaustive and unique record of astronomical research during this interval. It is particularly useful for astronomers and other scientists who want to gain an overview of a certain field, not necessarily near their own research area. Each Commission President was requested, by early 1984, to begin prep­ arations for the compilation of his/her Commission report. All members of Commissions were asked to supply details about their individual research pro­ grammes. The ensuing, very substantial task of concatenating was undertaken in late 1984 by the Presidents, often supported by a team of authors, all recog­ nized authorities in their fields. In order to preserve some measure of uni­ formity - which is in any case very difficult with so many authors - editorial guidelines were sent to Presidents, including the number of pages allotted to each Commission.